22 offers found, up to 22% less expensive than the average. Bifold interior doors are an easy, space-saving addition to the home. They are most commonly used for interior storage areas such as closets in bedrooms, laundry rooms, and bathrooms, or kitchen pantries. 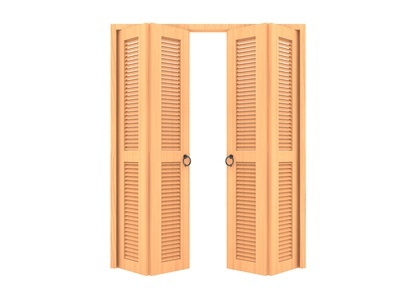 Bifold, or folding, doors refer to any door that folds, either inward or outward, to open. Using a track and pivot bracket, the doors glide smoothly when opened. This means bifold interior doors take up very little space and make it easy to give a space a wide opening, even if there is little surrounding space for the door to open. A two-door bifold consists of two hinged panels, and a four-door bifold is used for larger openings 4 to 8 feet wide and includes two 2-door bifolds that part to the left and right leaving the center wide open. Read on to learn more about bifold interior doors. There are many materials available for bifold interior doors, including wood, MDF, and molded panels. Bifold interior doors are also available with many kinds of inserts, including decorative glass, mirrors, and louvers. One of the most popular woods is oak, especially red oak. This type of wood is especially popular due to its wide availability, and this also makes it one of the more affordable options. Pine is another choice commonly used for bifold interior doors. Like red oak, pine is a fairly inexpensive choice, and pine is also one of the more customizable types of wood. Birch is also a popular wood species for bifold interior doors due to its straight grain and workability. Choosing bifold interior doors for your home is a fairly cost-effective decision. Expect to pay anywhere from $400 to $550. Keep in mind that this price includes the bifold interior doors, installation, and supplies. However, this price also depends on a few different factors, such as the type of material you choose. MDF bifold interior doors are generally the cheapest options. Keeping up with proper maintenance on your bifold interior doors will help them last much longer. The most important step for maintenance on the doors is cleaning them regularly. This will keep the doors looking great as well as functioning correctly. Additionally, make sure to fully inspect the bifold doors' hardware. Often, screws can loosen or go missing. You may also need to apply lubricant to the hinges to keep them from creaking or squeaking when opened. Bifold interior doors are a great way to hide away storage spaces in the home, including washer and dryers, pantry shelves, and bedroom closets. Not only are they cost effective, bifold interior doors also take up very little space in the home while open. There's also plenty of room to customize your bifold doors. Additionally, maintenance for bifold interior doors is very simple.